Scarfolk (previously) is the English country town that is caught in a perpetual ten-year loop from 1970-1980; in 1977, while the rest of the world was getting Kenner Star Wars toys, Scarfolk's children were treated to a line of Star Wars medical equipment from the good people at PalliativeToy. Back in 1977, SMS (Scarfolk Medical Supplies Ltd) desperately wanted to get on the Star Wars bandwagon and prepared a pitch for a series of potential tie-in products aimed at sick and other feeble citizens who are a drain on NHS resources. 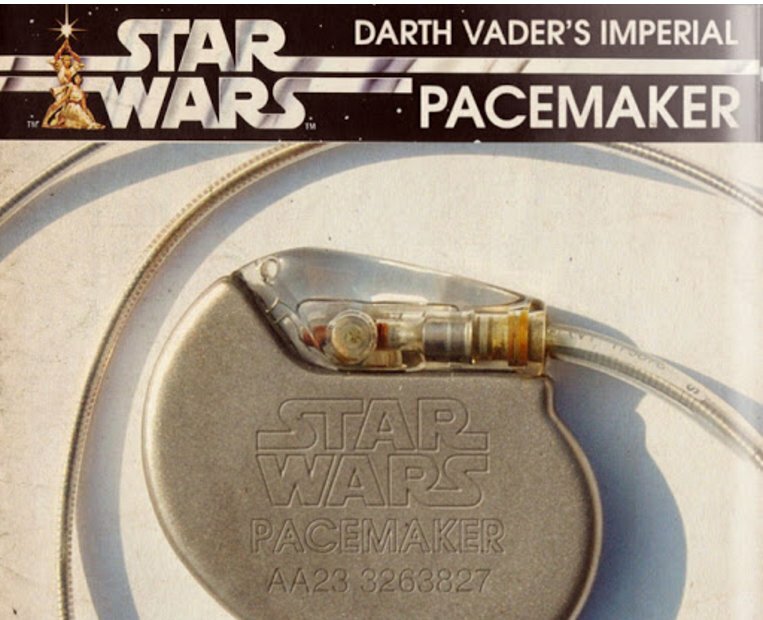 In addition to the product mockups posted above and below, there were also Darth Vader oxygen masks for asthmatics, X-Wing-X-Ray machines, Sith bedpans, and Chewbacca toupees. Even the slogan on the promotional catalogue reads: "Use the Forceps!" SMS were also very keen to tap the enormously valuable post-life demographic. For patients who didn't survive their medical conditions, there were mortuary items such as Greedo body bags, Jedi Embalming Materials and R2-D2 urns, all of which ensured that even after death it was impossible to escape exploitation by a movie brand.